It is pure joy to reveal this lovely cover. I’m dancing in my blue stockings with glee. 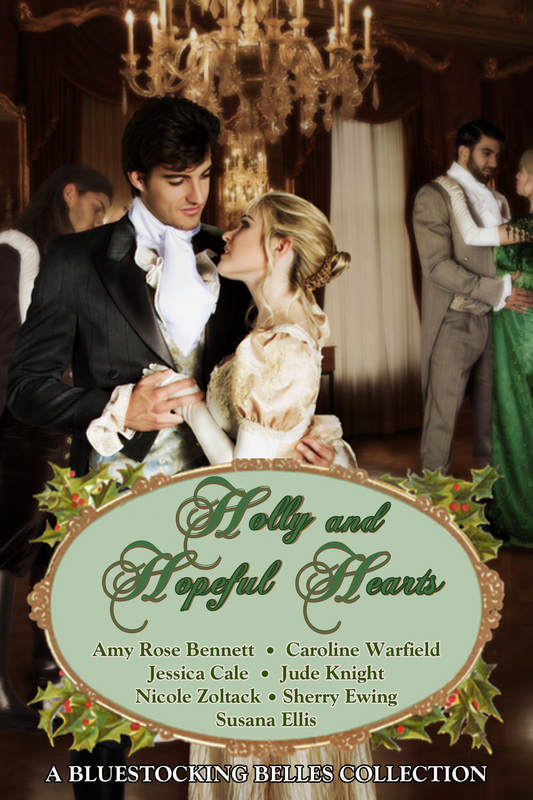 This year’s offering is packed with super stories, eight original novellas, over 500 pages of diverse characters, complex plots and plenty of happily-ever-after, all centered on the Duchess of Haverford’s charity ball. Because her favorite charity—and ours—is education for women and girls, 25% of all proceeds this year will go to the Malala Fund. Adam Halevy prospered under the tutelage of his distant cousin, powerful banker Nathaniel Baumann. He’s ready to find a suitable wife, someone who understands a woman’s role, and will make a traditional home. Why is Baumann’s outspoken, independent daughter the one woman who haunts his nights? She rose on the balls of her feet. “Papa can arrange this?” Pride and excitement pushed other emotions away. At the use of her name, Esther smiled. She ought to correct him for presuming, but in truth, it pleased her. For a moment, they looked at each other in perfect harmony. The moment grew awkward, and Esther thought she should say something. “You’re going to safeguard Papa’s interests?” she asked. “They don’t trust me because I’m Jewish,” he replied bitterly. “I wouldn’t know what your precious books suggest. I’m excluded from that kind of learning.” There. She had given voice to her greatest resentment. Let him make what he would out of that. Adam’s eyes softened, and Ether found herself leaning slightly toward him. A moment later, he stiffened and took a step back. “My wife will respect our traditions and keep a traditional home,” he announced. “Good luck to you in that endeavor, Miss Baumann,” he said with a jerky nod. He tapped his hat on his head with more force than needed. What happens when they meet again at the duchess’s ball? I love this story. Both the hero and the heroine are delightful. I loved having them in my novella, too. The scene with Adam and James was a lot of fun to write. Oh I agree. Your James is a gem; including him in my story strengthened it. It tickles me that the stories work so well together but still stand alone.